Dr. Damir D. Dzhafarov is Assistant Professor in the Department of Mathematics at UConn. Dr. Dzhafarov also serves as Associate Director of the University of Connecticut Logic Group, which The Institute has helped to support with funding. The Logic Group is an interdisciplinary research cluster with over 40 faculty and graduate student members from Mathematics, Philosophy, Linguistics, Psychology, Computer Science, Law, and other departments. Logic is a multi-faceted subject that, at its core, concerns language, structure, computation, reasoning and problem-solving, and their limitations and relationships. As such, it is an important area of interest in many disciplines, particularly those represented in the Logic Group, which have always maintained a strong tradition of scholarship in logic at UConn. Dr. Dzhafarov’s research is in mathematical logic, and specifically in the areas of computability theory and reverse mathematics. 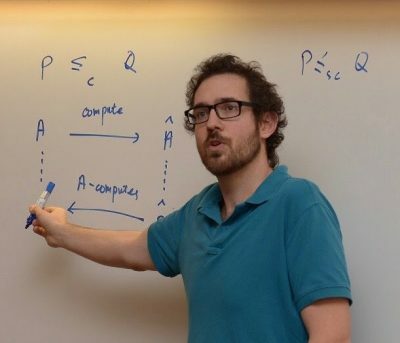 In his research, he seeks to understand the logical strength of mathematical problems—to characterize how close they are to being algorithmically solvable, and to understand the techniques needed to prove various results concerning them. In broad terms, this allows one to formalize the notions that one problem cannot be solved using the same methods as another, or that a particular technique used in a proof is indispensable. A well-known example, from a slightly different setting, is the P vs. NP problem, which asks if rapid (polynomial-time) solution-verification is essentially the same as rapid solution-finding. This work deepens our insights into the fundamental properties underlying different areas of mathematics, and reveals new connections between them. Two of the most prominent frameworks for this analysis are effective mathematics (also called applied computability theory) and reverse mathematics. Roughly, the former seeks to understand the strength of a problem in terms of the complexity of describing its solutions, while the latter seeks to do this in terms of the axioms needed to prove that solutions exist. One is thus a computational approach, the other a syntactic (or proof-theoretic) one. It is a common intuition among mathematicians that theorems in very disparate areas of mathematics can be strongly evocative of each other, and that the same patterns of problem-solving crop up in solutions to apparently unrelated problems. These frameworks provide a confirmation for this intuition. Indeed, a striking fact demonstrated by this research is that a vast number of mathematical theorems can be broadly classified into just five main types. This suggests that the methods underlying much of mathematical practice, across different fields, are deeply interrelated. Dr. Dzhafarov’s research has appeared in high tier mathematics journals, such as Advances in Mathematics, Transactions of the American Mathematical Society, and the Journal for Symbolic Logic. His work has been supported by a variety of national and international agencies, including the U.S. National Science Foundation and the Simons Foundation. Dr. Dzhafarov obtained his Ph.D. at the University of Chicago, and prior to coming to UConn, was a Visiting Postdoctoral Fellow at the National University of Singapore, and then an NSF Postdoctoral Fellow at the University of Notre Dame and the University of California, Berkeley.